A company of more than 2 centuries of history, Peugeot, the French manufacturer of coffee grinders, car, motorcycle and bicycle, each in its time, but these are areas in which decided to bet Armand Peugeot, its founder. And the case today has to do with the line of bicycles that has been doing since 1882, and are still determined to prove that their brand is still going at the pace of what’s new today. In referring to this time already it is therefore common to see bicycles powered by electricity, and there is variety among the brands that have chosen to take their own electric bicycle, for example we have: E-Bike, of Ford or also soon, folding electric bicycle Gi FlyBike, among a lot of other bicycle you can take as an example of competition that awaits as the Peugeot EF01. 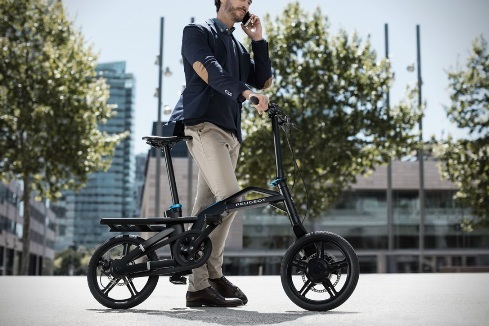 With the EF01 is good to make clear that it is not really the first electric bicycle of the French manufacturer, but if it is the first with folding design that Peugeot has made. The small size of the wheels provides better ability to pick up the bicycle as much as possible and adding the well-known approximate weight, which is according to less than about 17 kilos, which is not for the fact that it is provided with an engine and a battery. The Peugeot EF01 is an easy bicycle to fold and deploy. Its design is the work of Peugeot Design Lab and boasts a system that allows you to save the best unfolded position. Now, as regards the autonomous system of the bicycle it is capable of moving at 20 kilometers per hour, just over an hour on the battery charge. Its engine is 16 inch, being located in the rear. Also, if something is very common today, it is that for everything there is an application that allows any type of connectivity with your smartphone, and Peugeot did with its new bike, which you can connect to your phone using an app through Bluetooth connectivity. But do not accelerate; which regards the sale of the EF01, the truth is that it is not yet for sale and Peugeot waiting for the Paris Auto Show, where undoubtedly its new bicycle will occupy an important place between the innovations.